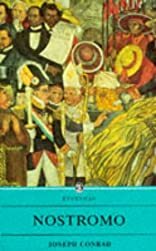 The setting for Nostramo (1904) by Joseph Conrad is an imaginary South American state, Costaguana, intended to be typical of that continent. At the outset, it is ruled by a brutal and corrupt dictator after a short period of enlightened liberal rule.Only the Occidental Province reamins a refuge of enlightenment and comparative prosperity and the story is of how the Occidental republic establishes its independence of the rest of the country, but at the same time, loses its ideals which inspired it in the struggle. The narrative revolves around five main characters, united by the theme of individual isolation even in cooperation with one another.